Starting 6 October 2018 through General Conference 2019 there will be a celebration of our 50 years! Join us for a big fancy party Saturday Night. Come to Founders MCC for a celebratory Worship Service. Click Here for access these resources! 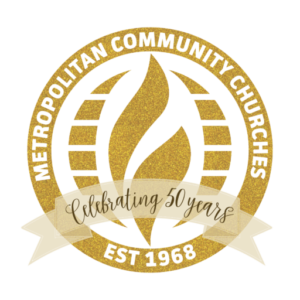 Bring people together in your community and congregation in the style of MCC’s first meeting at Rev. Troy Perry’s home. Like a house worship service, an order of worship will be provided with MCC hymns and prayers. In place of a sermon, questions will be asked like: What brought you to MCC? What keeps you coming back? What are your hopes for the next generation? A resource kit will be provided that includes tips for conducting the Stories campaign, an order of events, advertising materials, and an addendum with adaptations, because we’re MCC and everyone’s celebration certainly will be unique! Let us know when your celebration will happen so we can track meetings around the world. Share the stories people tell at your event online so more people can hear the impact of MCC around the world.